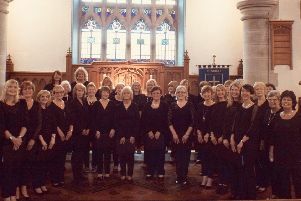 Whitehead Ladies’ Choir will present an evening of music on Saturday June 10. The concert will take place at Whitehead Primary School, starting at 7.30 pm. Special guests will be Gillian McCutcheon, clarinet and Michael Harrison, piano. The musical director is Diane Creighton, accompanist, Michael Harrison. Tickets, priced at £5, are available from The Bank House, in Whitehead. All proceeds will be in aid of the 1 in 3 Cancer Support charity. 1 in 3 Cancer Support is a local cancer charity founded in 2008 to assist patients and ex-patients of cancer treatment, as well as their families and carers by providing them with free access to practical support services.